One of favorite authors, James Martin, S.J. is on the latest show of On Being with Krista Tippett. Not surprisingly, the title of the show is “Finding God in All Things”, which is a summary of Ignatian Spirituality. Fr. Martin’s writings, especially his book “The Jesuit Guide to (Almost) Everything” were very instrumental in my adult move from agnosticism to Catholicism. You can find links to the episode here, including podcast information and information on when it is being played on your local NPR station. This entry was posted in Ignatian Spirituality and tagged Finding God in All Things, Ignatian, Ignatian Spirituality, James Martin, James Martin S.J., James Martin SJ, Jesuit, Krista Tippett, On Being, Pope Francis. Bookmark the permalink. That is a great quote. Thank you for sharing. It is so true that if we stop and appreciate the beauty all around us in nature and in those people we interact with everything is different. I have a long ways to go but I am working on it :-). We all have a long way to go, my friend. The trick is to realize you’ll never get it all done so best to enjoy the journey. Thanks for the book referral. You are welcome Rosaliene. It is an easy read and was a life changer for me. This is excellent, William! Like you, I enjoyed The Jesuit Guide to (Almost) Everything after finding it at my local library. At this stage in my life, I’ve been flirting in a kind of romantic way with my Catholic upbringing, especially with respect to the work of the Jesuits. Some brilliant fellows, and Teilhard de Chardin is a major inspiration for me to say the least. I just haven’t taken the leap *back* into Catholicism in any formal way. May be one day, that will change, but for now, I remain pleasantly agnostic towards organized faiths! Or perhaps, as Dr. Jeff Kripal suggests, I’m already a part of the “religion of no religion” – or American democratic spirituality – here in North America. Good posts, as always. Keep up the great work my friend. Thank you for the kind comments. I definitely agree with you on Teilhard and other Jesuits :-). I appreciate you stopping by to share your wisdom and experience. We are all pilgrims in this life. I wish you well on your journey my friend. My husband LOVES that book! He talks about it all the time. Victoria, your husband would love the interview also. It is classic James Martin in that it is both very funny and very insightful. There is lots of material for homilies also :-). I am very late to commenting, but I was grateful to see your post when it first published. 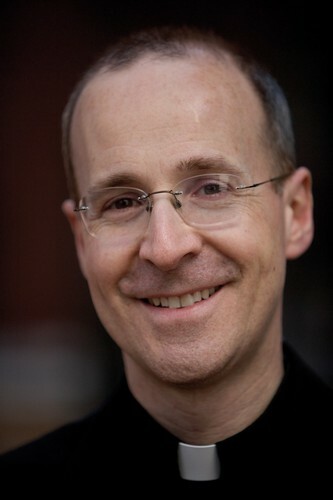 Having listened to the interview at this point, I am so grateful that James Martin SJ was interviewed by Krista Tippett. I have the pleasure and privilege of having met and corresponded with Fr. Jim. He is a real gift to the world, and he lives so generously. He is, as you have noted, both insightful and very, very funny. Thank you Fran. It must have been a treat to have worked with Fr. Jim. He has been a big influence on me.